American chef François de Mélogue, founder of award-winning restaurant Pili Pili in his hometown of Chicago, is a strong advocate of regional French cuisines, specifically the rustic cuisines of Lyon and Provence. 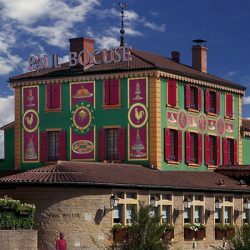 He tells us about his first experience at Paul Bocuse restaurant (part 2/3). Most people cannot afford a $500 lunch every day, so we must pick and choose those splurges carefully. 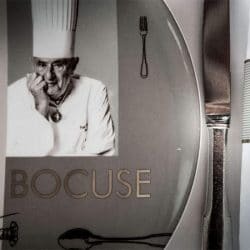 We chose the 275 euro menu ‘Paul Bocuse’ because it was a plated journey through Paul’s most memorable dishes, though I admit I thought of supplementing with a few more I wanted to try. I can still remember the lingering flavors of this lovely amuse. Every spoonful joyously reminded me of the scene in the movie ‘Ratatouille’ where Anton Ego is transported to his youth by a simple spoonful of ratatouille. This dish embodied summer and transported me to my youth where I spent summers in Provence with my family. We enjoyed this small bite with a flute of Perrier Jouet. Warning: Get used to me fawning over every single dish. This course was probably my favorite; every bite was more phenomenal than the one preceding it. 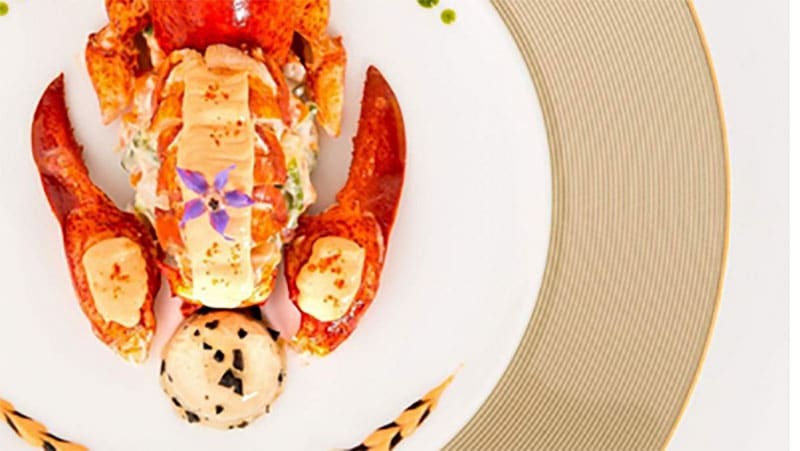 Lobster in an iced Pouilly Fuissé court bouillon. 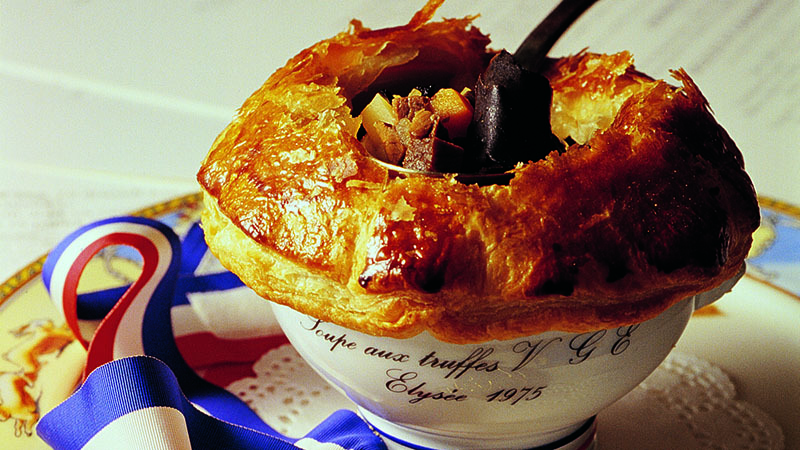 © Paul Bocuse. Our sommelier, Jack Rouget, expertly paired it with a 2015 Domaine Faury Condrieu made by winemaker Lionel Faury. Lionel has bucked the modern trend of making overripe wines in new wood and produces highly perfumed, classic viogniers that sing of their terroir. The combination of rich shellfish and Viognier was epic; the perfectly poached lobster danced in the jellied poaching liquid while the celery puree added a mild sweetness that added to the flavor choir. SECOND COURSE: TRUFFLE SOUP V.G.E. Oh my god, this dish was better than I ever hoped for; I had made it several times in my career and thought I had mastered it; boy was I wrong. 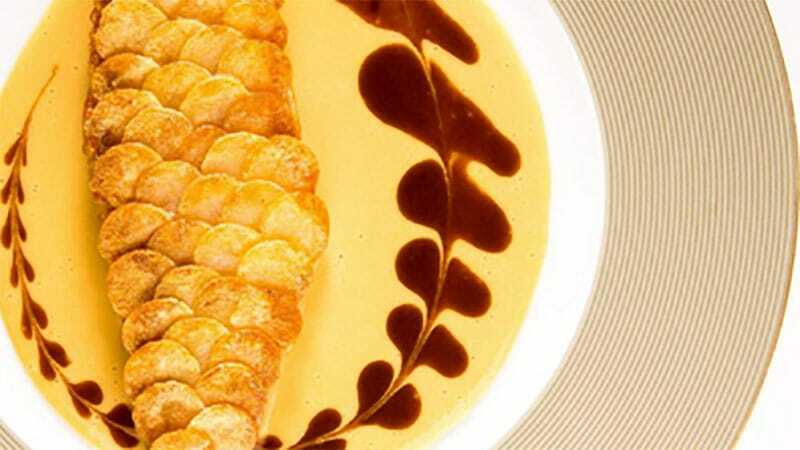 No one needs a history lesson, though it should be noted that Chef Paul created the soup when French president Valéry Giscard d’Estaing awarded him with the Cross of Légion d’honneur as ambassador of French cooking on February 25th, 1975. The paired wine was a 2015 Drouhin Vaudon Chablis Premier Cru Mont de Milieu. Strangely, if you read reviews you will see people describe the minerality and citrus flavors predominate in the wine, but in addition, it almost had peachy flavor normally not found in Chablis. Another classic from deep within the repertoire of Bocuse; a timeless preparation that just sang the glories of simplicity and perfection. The potato scales maintained a slight crunch while remaining moist, and the fish was just perfectly done. Simple dishes are the hardest to master because there is nothing to hide behind. The beurre blanc added a luxuriousness that complemented the whole dish. The wine pairing of 2017 Claude Riffault Les Chasseignes Sancerre Blanc on this course was only ok. I love Sancerre’s but felt the wine worked better on its own rather than with the fish.